Eat, Play, Learn: Y is for YAY! To celebrate the publication of Proceedings of the Learning Connection Summit: Nutrition, Physical Activity, and Student Achievement, I’m offering a short daily post during February on the ABCs of the health and academics. I admit that I was struggling with what to use for Y – and then my latest blog for the Huffington Post was published today on the Parents page: 6 Secrets Every Parent (and School) Should Know About Academic Success, by Dayle Hayes, MS, RD. Hope you will take time to read it online – or below! You would do anything to insure your children’s academic success, right? Helping with homework, meeting with teachers, arranging for tutors — whatever it takes to give them that little extra boost. You also care about your kids’ health — and want them to eat right and get enough physical activity to stay healthy. What you may not know is how closely connected academic success is to what kids eat and how active they are. Experts in both education and health are beginning to realize that more attention to children’s bodies will also help their brains work better. Whether you call it the Learning Connection or the Wellness Impact, the message to parents and schools is clear: Eating smarter and moving more are essential for optimal performance and behavior in the classroom. Here are six ways you and your school district can work together to help all students succeed. We all know that mornings can be crazy busy and some kids just aren’t hungry before school. But, this is a no brainer — literally! Without fuel for morning classes, students cannot focus, concentrate and learn. At home or school (or even in a car or bus), breakfast changes everything. Any breakfast is better than no breakfast and a bowl of whole grain cereal with milk and fruit can actually be a good source of key nutrients. Even if your kids eat at home in the morning, your support for school breakfast is critical for those children who need it. One kid who is too hungry to learn can disrupt an entire classroom. On the other hand, breakfast in the classroom, like this one in Reynoldsburg (OH), helps students fuel up for learning. Some of the hottest research on activity and brain function comes out of Dr. Charles Hillman’s lab at the University of Illinois. Brain imaging and other tests show that a simple 20-minute walk can improve a student’s performance in both reading and math. Takeaway for caring parents? Walking (or biking) to school means your kids arrive with brains that are ready to learn. Concerned about their safety? Get your workout by walking or biking with them — or get involved in a Safe Routes to School group. For example, our community is having a Walk-Bike Summit in March. Physical activity at recess is good for kids brains (and their bodies) for the exactly the same reasons as walking or biking to school. However, recess before lunch has been shown to have some other very important benefits. When children are active before coming to the cafeteria, they eat better and behave better. Studies show that they actually eat more entrée, vegetables and fruits — and drink more milk. When kids rush through lunch so they can run out to play, lots of food goes into the garbage can and students are short-changed on afternoon fuel. Breakfast helps children learn in the morning, but lunch is just as necessary for afternoon classes. As just noted, there is a critical academic reason to be concerned about those half-eaten lunches that your children bring home — and the full garbage cans in some school cafeterias. Sadly, many cafeterias are not pleasant, positive places to enjoy a meal. The good news is that they can be. All they need is a bit of bright décor and adults who are trained to encourage appropriate conversations rather than just patrolling between the tables and telling everyone to hurry up and eat. Parents can help create Comfortable Cafeterias by eating with their children and making positive, pleasant mealtimes part of a local wellness policy. Remember that brain research about the benefits of a 20-minute walk? Short bouts of aerobic activity in the classroom can also work wonders. A short activity break re-energizers young brains and their bodies too. Research shows that a brain break can be especially valuable when transitioning from one topic to another. Free online programs like Jammin’ Minute and Move to Learn can bring fun videos and activity tips into any classroom. Check with your children’s teachers to see if they are taking advantage of this effective and educational technique. Teachers are finding that the few minutes spent on activity actually add minutes of instructional time and putting a smarter student in the chair. Since children are all-day learners, they need regular refueling throughout the day, including after-school snacks — for sports, homework and academic enrichment programs. Many snack foods (candy, chips, soft drinks, etc.) do not offer the lasting power that kids need. USDA’s Smart Snacks in Schools regulations are coming to school-day sales this fall — and it is important that students have access to the same nutrient-rich foods after the school day ends. Fruits and veggies are always good, but protein power is even more important. Yogurt, string cheese, nuts, nut butters, sliced deli meats, beef jerky, hard cooked eggs and hummus can all be incorporated into at home or on-the-go smart snack routines. 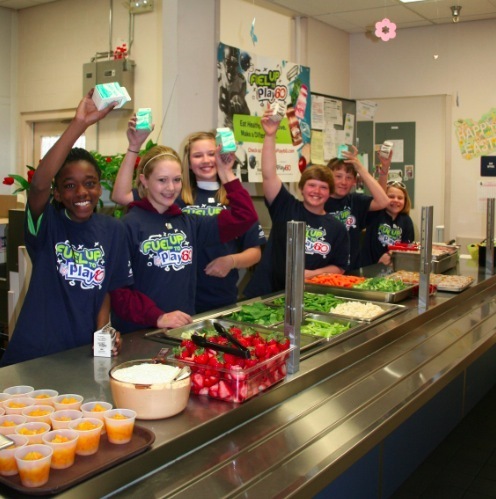 Programs like Fuel Up to Play 60 can engage students as leaders, like these middle schoolers in Naches (WA), in making changes in what their school offers for meals, snacks and physical activity. Next time you review a report card or discuss your child’s performance at school, be sure that nutrition and fitness are part of the conversation. Using the Learning Connection to your advantage can make a significant impact on their school success.